Peter Junior Paramore was born in Apia, Samoa (formally Western Samoa) on 18/11/1968. Having grown up in Samoa, Paramore moved to Auckland, New Zealand when he was 15. It was here whilst attending Hillary College in South Auckland that he first picked up a rugby ball, before extending his rugby education at the East Tamaki Rugby club, which led to him being selected to represent the Auckland Under 20’s side. In 1990 the Paramore family moved further south of Auckland to Manurewa, where Junior joined the local Manurewa Rugby Club, and was selected to represent the Counties provincial side along with future All Blacks star Jonah Lomu. By now he was gaining a reputation as a powerful and mobile back row forward in the the 15 a side version of the game, but it was sevens that gave him his first taste of international rugby when he was included in the Western Samoa squad for the 1991 Hong Kong Sevens, a tournament he went onto represent his homeland in twice more in 1992 and 1994. The next step up the international ladder came slightly fortuitously for Paramore during a sevens trip to Western Samoa, where the full national team were holding trials in the lead up to the 1991 world cup. He was asked to attend after an injury to one of the trialists, and did enough to impress the national coaches and earn himself place in the squad. He made his test debut for Western Samoa on 28/05/1991 in a South Pacific Championships victory over Tonga in Nuku A’lofa. Maintaining his place in the squad for the world cup later that year, where Western Samoa pulled off one the greatest upsets in world cup history when they beat Wales 16-13 in a group game at the Cardiff Arms Park. Two years later, having already been selected in the Western Samoa squad for the 1993 Hong Kong Sevens and Sevens World Cup, Paramore was controversially selected to represent New Zealand in both tournaments, which proved to enticing an opportunity to turn down. By 1995 he was back in the blue jersey of his native Western Samoa and once again made the squad for the world cup in South Africa, where he contributed to victories over Italy and Argentina in the group stage, before starting in Western Samoa’s quarter final defeat to the hosts who went on to lift the trophy. In 1999, history repeated itself during the world cup when Samoa, as they were now known, defeated Wales 38-31 in the group stages at the Millennium Stadium, with Paramore starring in another famous victory for the South Pacific Island. Having also scored a try in their defeat to Argentina, he was missing from the side that lost to Scotland in the quarter final play-offs at Murrayfield. After 10 years on the international scene, which included three world cups and 6 tries for Samoa, Paramore earned his 29th and final international cap in 2001 against Fiji in Tokyo in the Pacific Rim Championship. In early 1996, Paramore switched codes and joined the now defunct Newcastle based rugby league outfit Hunter Mariners, thus providing him with the opportunity to become a professional sportsman. The Mariners were formed in mid-1995 and was later disbanded at the end of 1997. The club was formed because of the Super League War, which was the rivalry between the traditional Australian Rugby League competition and the new media driven Super League competition. Due to this corporate dispute and the resulting uncertainty surrounding rugby league in Australia during this period, Paramore accepted the chance to go on a season long loan to Castleford Tigers in the newly formed Super League in England, without playing a competitive game for the Mariners. Just before he was due to return to Australia at the end of the 1996 Super League season, Paramore was offered the chance to join Bedford Blues in the Courage League National Division Two. In his first season at Goldington Road he was named Bedford’s player of the year after helping the club to finish fourth in the league table, before losing a two leg promotion playoff against Bristol, who had finished 9th in division one. The following season he was voted the leagues players player of the year as he helped them to the 1997-1998 Allied Dunbar Premiership Division Two title and with it promotion to the top tier of English rugby for the first time in five seasons. Earlier that season he had demonstrated his versatility when he played out of position in the centre during Bedford’s Cheltenham and Gloucester Cup final defeat to Gloucester at Franklins Gardens, Northampton. Promotion to the Premiership provided Paramore with the opportunity to earn a living from the game he loved after rugby union in England had turned professional in 1996. Bedford experienced a sense of deja vu in the 1999 Cheltenham and Gloucester Cup final when once again they lost to Gloucester at Franklins Gardens, with Paramore starting for the Blues at blind side flanker. With only one team relegated, Paramore helped Bedford maintain their top flight status after finishing the 1998-1999 Premiership season in 13th, one place off the the bottom of the table. In April 1999, Paramore stunned Bedford when he signed for Premiership rivals Gloucester on a three year contract. Joining his cousin and fellow Western Samoa international Terry Fanolua at Kingsholm. Due to surgery on a neck injury sustained whilst at Bedford, Paramore didn’t make his first team debut for Gloucester until 03/01/2000 in a Tetley’s Bitter Cup victory over Bath at Kingsholm, before scoring his first try for the club in the next round during a 54-12 victory over Orrell. He helped Gloucester finish third in the 1999-2000 Premiership table, resulting in Gloucester qualifying for the Heineken Cup for the first time since it’s inception in 1995. In September 2000, Gloucester secured permission from the RFU for Paramore to play Premiership rugby as a British resident under residency rules. Gloucester established his right to play in England without the need for a work permit by proving that he had enjoyed permanent employment in Britain for at least four years. This development enabled the then Gloucester coach Philippe Saint-Andre to play his southern hemisphere imports – Paramore, Terry Fanolua and Jason Little – in the same side. He went on to start the 2001 Heineken Cup semi final against Leicester at Vicarage Road, Watford, as Gloucester narrowly missed out on a place in European club rugby’s show piece final after going down 19-15 to the eventual champions. The following season Paramore helped the cherry and whites to finish third in the Premiership table, before starting in the 28-23 playoff final victory over Bristol Shoguns at Twickenham, earning the club a wildcard European qualification after Leicester finished top as champions. 2002-2003 proved to be a season of mixed fortunes for Paramore and Gloucester. 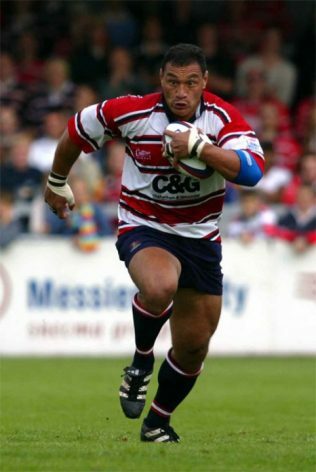 The Samoan came off the bench for Andy Hazell in the 2003 Powergen Cup final victory over Northampton at Twickenham, and was a key figure in Gloucester’s first ever table topping campaign. However, having finished 15 points clear of their nearest rivals, they faced Wasps in the inaugural play off final to decide the Premiership champions. Paramore started the Twickenham final but could do nothing to prevent Wasps from achieving an emphatic 39-3 victory and with it the Premiership title, much to Gloucester’s frustration after their dominance of domestic rugby over the previous months. Having broken his arm in October 2003, which led to a lengthy layoff, Paramore went onto play in the 2004 Heineken Cup quarter final defeat to Wasps, who were fast becoming a thorn in Gloucester’s side. His last game for Gloucester came at the end of the 2003-2004 campaign in an away defeat at local rivals Bath. Paramore was a main-stay in Gloucester’s squad from 1999-2004, playing 97 Premiership games and scoring 33 tries. Paramore’s decision to leave Gloucester came after the then Bedford Blues coach Rudi Stauli offered him the opportunity to return to his old club as player coach. At 35 years old and with his playing days drawing to an end Paramore was beginning to plan for a future career within the game, having enjoyed his time spent coaching local clubs and schools whilst playing for Gloucester. Prior to taking up his duties with the Blues he was selected to play for the Barbarians for the first time against Portugal, scoring a try in a 66-34 win for the famous representative side. During his time back at Bedford he helped the club win the 2005 Powergen Shield after a narrow 14-13 victory over Plymouth Albion at Twickenham, and finish second in the 2005-2006 National Division One table. In April 2006 Paramore was finally forced to retire from playing after a second neck injury. Following another operation, the former Samoan international was advised by his surgeon that any further aggravation could lead to more permanent damage. In August 2006, Paramore was awarded a testimonial match by Bedford in recognition of his long and illustrious career. The match was contested between a Junior’s Blues XV and a Gloucester XV at Goldington Road. With his playing days behind him Paramore embarked on a career in coaching after being appointed coach of Luton RFC in the summer of 2006 and helped guide them to the 2006-2007 Midlands One title. In July 2007, he linked up with ex-Gloucester team mate Robert Todd on the coaching staff at Bournemouth RFC, where he spent three seasons, which included a fifth placed finish in National Three South West in his final year. Next stop in his coaching education was Basingstoke RFC, where in June 2010 he was named head coach of the National Three London and SE outfit on a full-time contract. In addition to his role as first- team coach, he was also employed to deliver coaching sessions in schools, colleges and universities as part of the club’s community programme. Paramore was forced to leave Basingstoke at the end of the 2010-2011 season after a Government spending review meant the club were unable to sustain his position due to funding for their community rugby programme being slashed. Since parting company with Basingstoke Junior Paramore has focused his attention on coaching youngsters in the South of England. He has set up his own rugby academy in association with Canford School in Wimbourne, which caters for ages 12-14, U15s, U16s and U17s, and coaches at Totton College Rugby academy alongside former Northampton saints flanker Budge Poutney. Thanks, Andrew – you are right – well-spotted! We’ve now corrected the entry. The Heineken Cup semi-final between Leicester and Gloucester was at Vicarage Road, Watford not the City Ground, Nottingham. I know, I was there! Great site, by the way! Does anyone have an email contact for Junior Paramore? I am wanting to do a cultural background interview on him seeking his family villages and cultural heritage, please feel free to email me, thank you.